All children in Bothwell’s two primary schools, St Bride’s and Bothwell Primary, are honorary members of Bothwell Historical Society. This means that approximately 700 local children have links with the Society. Since the foundation of the Society in 2011 committee members have attended the schools on numerous occasions interacting with the pupils, supporting them in project work, taking part in discussions with school staff and attending school functions as invited guests. In the Spring term of 2016, Bothwell Primary School (Primary 7: 11 and 12 years old), requested help from the Society with a comprehensive project on the history of the village including the castle, the Parish Church, the historic Library building and our mining heritage. The teacher, Mrs McHenry, was anxious that the pupils should not simply copy information from the internet but that they should have access to original research material. This was provided by Committee members, Eric Denton, John Hart, George Maxwell, Brian Sharp and Jack Gallacher and delivered to the school. In June, Primary 7 pupils were welcomed by the Minister of Bothwell, Rev James Gibson to the Parish Church and were given a conducted tour of the building and its grounds by Society Committee members. The children voted the visit a great success and their project work was displayed on the walls of the classroom. Primary 3 (aged 7 and 8) at St Bride’s took enthusiastically to their project concentrating on Bothwell Castle. Having borrowed artefacts from the castle, Jack Gallacher visited the school. To the delight of the children, they were able to see swords, shields, armour and models of siege engines. In April, suitably attired as knights and fair ladies, the young people paid a visit to the castle where the Custodian Chris Timmons regaled them with tales of the castle’s history. Later they were able to let off steam with mock sword fights. Again their art work was displayed on the classroom walls. Eric Denton and Jack Gallacher were invited to the school by class teacher Miss Paula Slater to record the children’s impressions of their visit to the castle on a CD. Following discussions between the Society and the teachers in both schools, it was suggested that both projects could be developed further and that the children’s work should be exhibited to the public in the Library during the village’s “Scarecrow Festival” week. 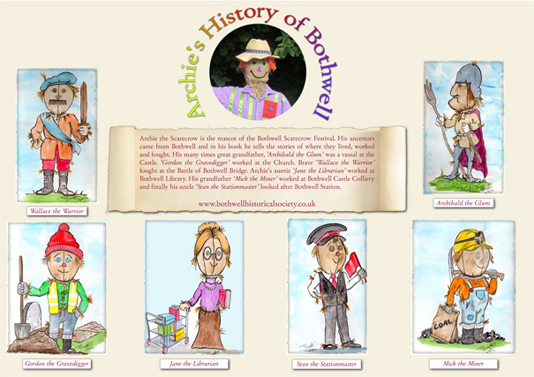 At the same time the project material should be published in the form of a book for children to be called,“Archie’s History of Bothwell” (Archie being the Scarecrow festival’s mascot). The book which was highly commended by Scotland’s foremost historian, Professor Sir Tom Devine, Honorary president of Bothwell Historical Society, was an instant success and only a few copies remain to be sold at the cost of £5. Books may be purchased at Bothwell Post Office and Bothwell Library. The grand finale of the projects came when the work of the children in both schools, Primary 7 in Bothwell Primary School and Primary 3 in St Bride’s Primary School were joined together at an exhibition in Bothwell’s Library, The Donald Institute, during the Scarecrow Festival from the 6th to the 11th of September. Comments recorded in the Library’s visitors’ book are a clear indication that members of the public were highly impressed by the work of all the children. On the 12th October 2018, the Chairman was pleased to visit St Bride’s Primary School to meet the children of two classes in primary 3. The school has a strong policy of linking with local organisations including the Historical Society to develop the children’s awareness not only of their heritage, but of the need to appreciate and cherish the modern community in which they live. Like many children of that age group. primary 3 members were articulate, enthusiastic and very knowledgeable of Bothwell’s heritage from the Middle Ages, the Enlightenment and the Industrial Revolution. Jack Gallacher learned a great deal from the young people and looks forward to the next visit to St Bride’s.